Citizens Hose Company NO. 1 Historic Marker; located in Smyrna (Kent County DE). Photo by Jimmy Emerson, DVM/Flickr (Noncommercial Use Permitted with Attribution/No Derivative Works). The history of Citizens Hose Company NO. 1, Inc. began on January 6, 1886 when thirty residents of Smyrna voted to “go into permanent organization” to serve the firefighting needs of the community. Their charter was approved by the Delaware Legislature on January 19, 1886. The Smyrna Opera House was expanded to accommodate the company in 1887. 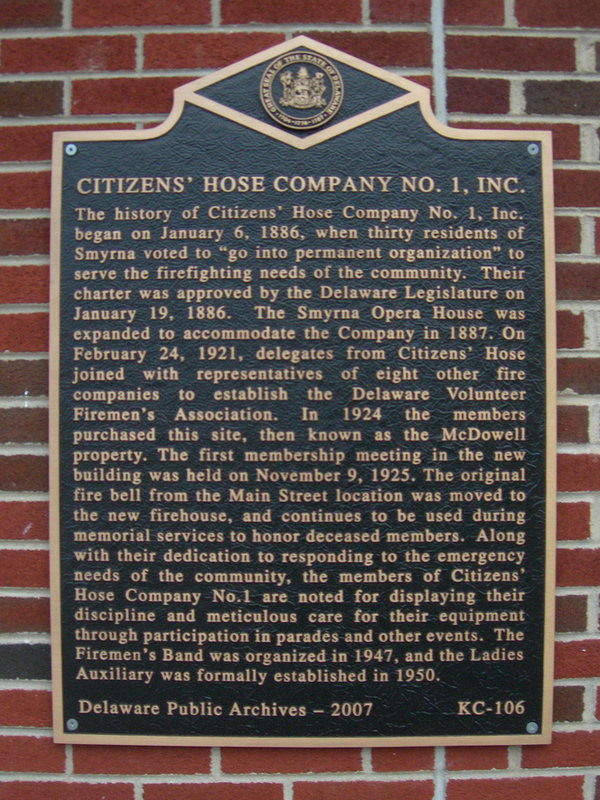 On February 24, 1921, delegates from Citizens Hose joined with representatives of eight other fire companies to establish the Delaware Volunteer Firemen’s Association. In 1924 the members purchased this site then known as the McDowell property. The first membership meeting in the new building was held on November 9, 1925. The original fire bell from the Main Street location was moved to the new firehouse, and continues to be used during memorial services to honor deceased members. Along with their dedication to responding to the emergency needs of the community, the members of Citizens Hose Company NO. 1 are noted for displaying their discipline and meticulous care for their equipment through participation in parades and other events. The Fireman’s Band was organized in 1947, and the Ladies Auxiliary was formally established in 1950.